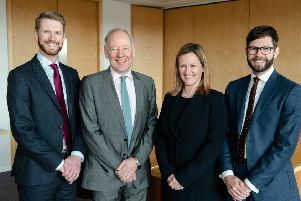 PARTNERS at mid-tier Scottish law firm Tods Murray enjoyed a 10 per cent rise in profits last year after a pick-up in work for its banking, employment and private client departments. The Edinburgh-based practice grew its pre-tax profits to £2.5 million in the year to 31 March from £2.3m in the previous 12 months, according to accounts filed at Companies House. The number of partners – formally called members of the firm’s limited liability partnership – dipped to 34 from 35, giving an average profit per member of £75,000. The highest-paid member took home £112,100. Tods Murray’s rising profits came on the back of fee income going up to £12.6m from £11.8m, with the banking team posting a 28 per cent gain in turnover and the private client department enjoying a 35 per cent boost. The practice’s customers include Barclays, Lloyds Banking Group and Santander, with Henderson Global Investors, Macquarie Bank and M&G being added during the past year. The firm has also acted for Goldman Sachs, HSBC and JP Morgan, and Terra Firma. Dunsire remained tight-lipped over whether the firm was in talks to merge with any other practices. Tods Murray took over private client boutique Fyfe Ireland in 2012.